Prisme factory occupation: make the bosses think twice! Royal Mail sell-off: step up the campaign! A Stalinist betrayal? Aye Write! What's at stake in the fourth "Great Depression"? Reply to Mark Sandell (Solidarity 3/147) on the engineering construction strikes. At the time of going to press, the Prisme Packaging factory occupation in Dundee, which began when its owners announced closure of the company, is about to enter its fourth week. Dale Street spoke to David Taylor, one of the Prisme workers involved in the occupation. What progress has been made with the idea of setting up a workers’ co-operative? We have nearly finished this — we have just to meet with the accountant, and the Royal Bank of Scotland and the Clydesdale Bank. 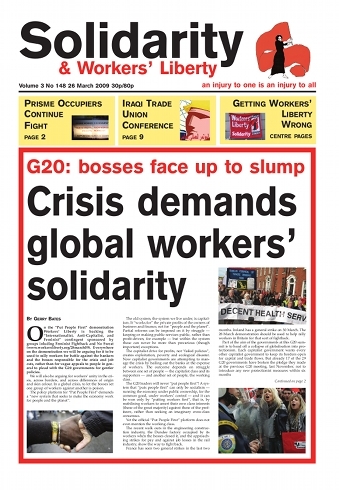 Pete Firmin, a CWU activist in London, spoke to Solidarity about the battle against privatisation of Royal Mail. Legislation to part-privatise the post was introduced into the House of Lords by the Government on 25 February, and is likely to reach the House of Commons in the next two or three months. Railworkers; TUC women's conference; Walthamstow Academy. The Social Work Activities Network (SWAN) describes itself as “a loose network of social work practitioners, academics, students and social welfare service users united in their concern that social work activity is being undermined by managerialism and marketisation, by the stigmatisation of service users and by welfare cuts and restrictions. Revelations from Mid Staffordshire Hospitals Trust bring into focus a depressing and frightening reality and all the concerns and warnings raised about the government’s drive to privatise the NHS. 400 people more than would have been expected died because of poor care and as the management focused on gaining Foundation Trust status. The worst recession in generations is underway, and workers and the young will be hit first and hardest. Public services are under threat, the environment is slipping off the agenda, and the BNP are experiencing unprecedented electoral success and growth. On top of that, Universities UK, the university bosses’ union, has just released a report calling for top-up fees to be doubled. Cambridge University Press recently announced plans to axe 160 jobs at two sites in Cambridge. Thirty redundancies at the company’s education department have already been confirmed, and management wanted a further 130 redundancies at the press itself. However, a concerted effort by the press workers, the local trades council, and local people has forced management to reduce the number of redundancies to 53. Students at Sheffield University have been in occupation of space in the Hicks Building since Monday 16 March; on 23 March the occupation spread to the university's new, extremely posh, flagship exhibition centre.